Although many of us deal with stress by scarfing down sweets and other junk food, we risk damaging our bodies in the process. On the other hand, we can ease our stress and strengthen our bodies with lots of natural foods. Some of the following are high in magnesium and potassium, others in Omega-3 fatty acids or vitamin C. Best of all, most of these good-for-you stress relieving foods may already be in your own kitchen. Nuts & Seeds: almonds cashews, sunflower seeds, pumpkin seeds. Good sources of magnesium, tryptophan, and B6. Dark Leafy Greens: kale, Swiss chard, and spinach. Rich in magnesium and potassium. Raw Fruit & Vegetables: carrots, celery, apples, and other crunchy produce. It’s the actual crunch factor that provides stress relief, much like chips and other junk foods do. 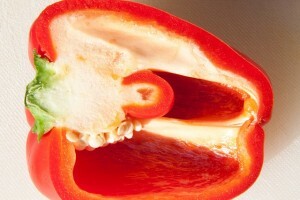 Vitamin C Foods: red and yellow sweet peppers, kiwi, broccoli, papaya, oranges and pineapple. Whole Grain Carbohydrates: brown rice, oatmeal, farro, quinoa, wheat “berries” (whole grains of wheat). Include any and all of these nutrient rich foods in your meals to modify your day-to-day stress and toss some nuts, seeds, raisins, and dried apricots together for an emergency snack!